"Life can be crappy, but you can be happy..."
Whew. Eric Idle references aside, that's a rough way to begin an album. 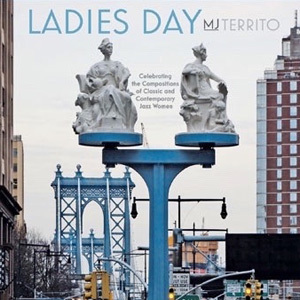 When I first listened to MJ Territo's new album, Ladies Day, I thought that I had wandered into the same lyrical steppe as with Jeannie Tanner's latest album, where every line is a little too on-the-nose. Fortunately that first song, written by Territo herself, is short--and everything that comes after it is much, much better. Territo came up with the idea for this album while assembling a set list for one of her gigs. She noticed that many of her song choices were written by women, and the Ladies Day project was born. Her choices are very interesting and more varied than you would think--Dave Brubeck wrote "In Your Own Sweet Way" with his wife Iola, for instance. She also includes straightforward versions of such standards as "Everything Is Moving Too Fast," which was co-written by Peggy Lee, and Abbey Lincoln's "You Gotta Pay the Band." For a more modern take, she's even included a version of Patricia Barber's "I Could Eat Your Words." This project would have lost some of its purity if Territo had chosen a bunch of session guys to back her in this recording. As a result, we have another all-woman band, just like the 3Divas CD I just reviewed earlier this week. 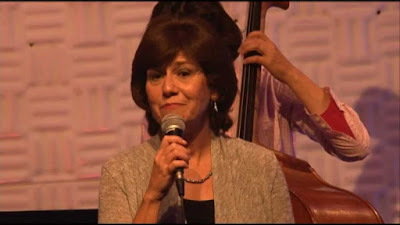 While I criticized 3Divas for relying too much on the outdated "diva" themes, I'm impressed with the way it's handled here--we have a group of talented musicians (pianist Linda Presgrave, bassist Iris Ornig, drummer Barbara Merjan, flautist Andrea Brachfeld, sax player Virginia Mayhew and harpist Brandee Younger) who simply dig in and make beautiful music. No qualifiers are needed. None of this would work if Territo's voice wasn't so strong and agile. She does come from the straight-on school of jazz singing, where everything note is delivered with clarity and emphasis, but she doesn't succumb to the plaintive. There's a loveliness in the way she holds onto notes as if she's caressing each one before releasing it out into the world. Ladies Day is, ultimately, a lively and cheerful collection of performances that are nicely realized and delivered with the sort of brio that comes with always looking at the bright side of life.